If there’s ever going to be a case for your MacBook Pro that is worthy of your attention or mine then it’s going to be the Moshi Codex. The guys at Aevoe have pulled one out of the bag because the Moshi Codex is an absolute blinder. You should all be familiar with the rules of good notebook case design. If it’s a tight fit then you’re snookered. There should be that element of glide and smoothness to putting your equipment away and not having to struggle with the zipper. That way when you’re in a quick get away there’s no fumbling about. The case must look good. No question about it. Don’t mistake this for flashing LEDs or kryptonite glow, a stylish design can be discreet or it can be as bold as a night out with that Lohan girl. If you want a multi-functioning case that lets you take your lipstick, make up and whatever else you carry in your wallet then look elsewhere. 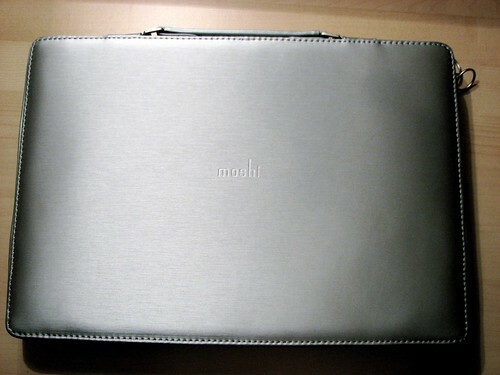 The Moshi Codex will hold your laptop and that is it. Which is why this one falls strictly in to the category of notebook ‘case’ rather than ‘bag’. Although I wouldn’t mind seeing a bag version of it. The Codex does well in the areas that so many others before it have failed to. Aevoe have designed the Moshi Codex to be this gorgeous ‘to the look and touch’ case which does a proper job of protecting your notebook. Where others have missed a trick, the Codex allows you to use your Mac without taking it out of the case. 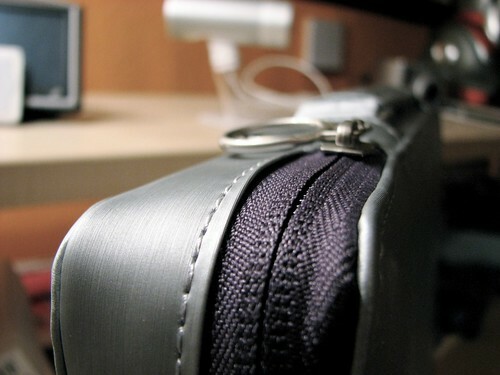 Simply unzip, open and you’re ready to rock and roll. So before you all tell me that there are cases out there which do this already. Well think again. There have been none that I have seen which offer you the ability to use your notebook whilst still in the case in a portable and compact solution that doesn’t add bulk or weight to the overall dimensions. The Moshi Codex succeeds in this area because when the whole thing is zipped up, somehow to the naked eye, the whole thing looks smaller than the notebook itself (some kind of physics defying technology built in – or just psychological mind trick?). Before I speak more about the case, one thing that has become important over the past few years is the presentation of the packaging that a product comes in. This has been further reinforced by sites which go as far as taking pictures of every step in the ‘un-boxing’ process as well as videos on YouTube. Apple are most well known for designing the un-boxing experience by carefully creating packaging so that when it comes to opening up the box of goodies, you’re treated to a pleasant experience. Why is this important? For a lot of people it affects them either consciously or sub-consciously. It can generate a sense of excitement in those previous few minutes when you are taking a product out for the very first time – you want to make a good impression. The designers of the Codex Moshi, Aevoe, appear to have put as much effort in to creating the packaging as they have done the product. When the package arrived at my desk, it came in a brown box. When I unpacked the brown box, at first glance I thought that what I saw was the actual product. After taking it out of the box, I realised that this was merely the packaging for the actual product inside. 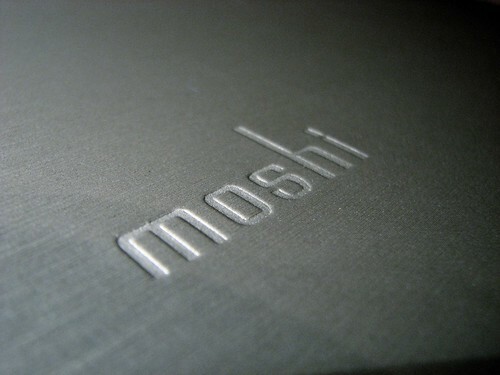 I can only describe the packaging as a slither of gorgeousness with its brushed aluminium look and embossed with the name moshi on the side of it. Even the handles had been thought about in the elaborately designed packaging. You can choose to carry this product under-arm or you can pull out the built in handles to carry it as a proper case. It’s all very nice and very over the top but it did what Aevoe designed it to do. And that was to invoke excitement in the holder as well as catch an eye or two whilst carrying this to my car. How could you not miss seeing the incredibly bright silver packaging? Now with that anti-climax over, lets talk about the case. 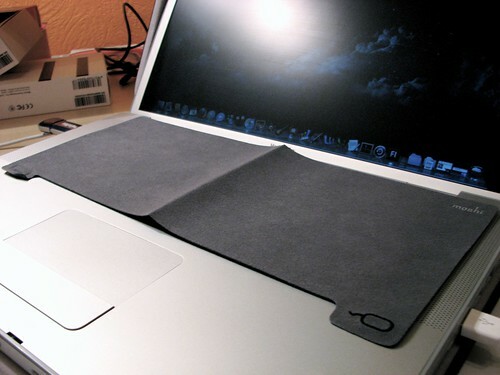 Viscotex is the material used in the moshi to cushion your Mac from shocks and impact. This material is very lightweight but very clever in that it is able to absorb shock effectively and distribute it across the surface. Upon impact, it softens the blow and then bounces back to its original form. 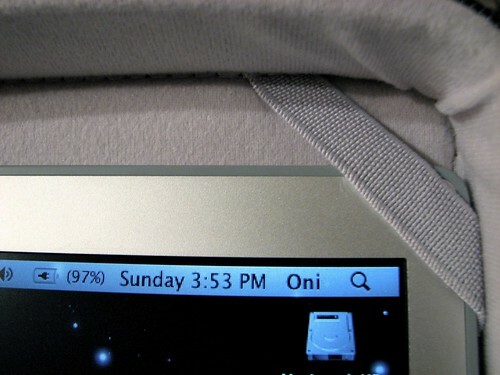 The lightweight material allows you to have your screen closed partially without it falling all the way down (resulting in your Mac going in to sleep mode). The exterior of the case is finished with a brushed metal look and is splash resistant (tested when it was raining heavily a few days ago), which can be cleaned using leather cleaners. Inside of the case is lined with Terahedron which helps keep your Mac clean and prevents any scratching of the aluminium casing on your MacBook Pro. 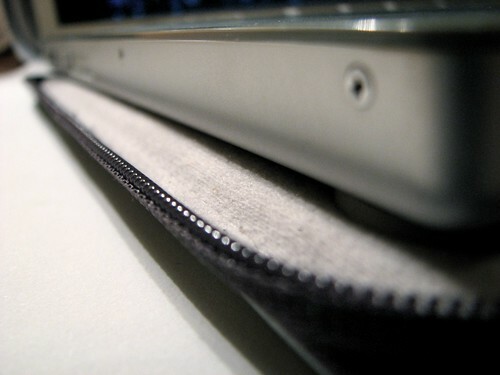 One concern that any Mac user will have when using a form factor hugging case or cover is scratching from the zipper around the edges. 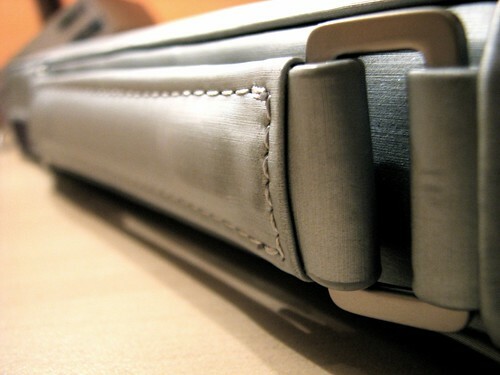 You will be glad to know that the zipper is spaced far away from where your Mac sits and with its thick walls around the case, your notebook will be safe and sound. One of the best features of this case is the ability to use your Mac without having to take it out, and when you’re ready to pack up and go you simply close it down, zip it up and you’re ready to go. 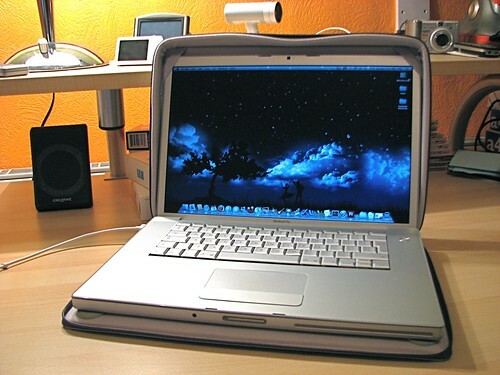 The Mac always sits inside the case even with the screen up. This is achieved using the two straps that are built in to the display portion of the case which effectively holds the display and the case together. So when you’re using your Mac the cover continues to protect your notebook. 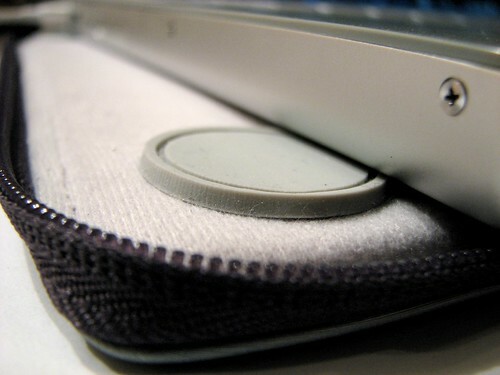 There are also round discs that are built in to the inside base portion of the case. These act as feet for sitting your Mac up and ensuring it has some ventilation underneath, which we all know is important for any notebook and having spent the past few weeks using my MacBook Pro (2GHz Core Duo model) I’ve yet to experience the fans kick in or feel that the notebook is overheating. In fact as I write this, iStat shows the enclosure bottom thermometer is reading at 39 Celsius. You can carry the Moshi Codex under arm like you would when using a sleeve cover or you can use the detachable handles to hold it briefcase style. The handle has a good feeling about it, that it’s substantial and secure. Two accessories ship with the main case. 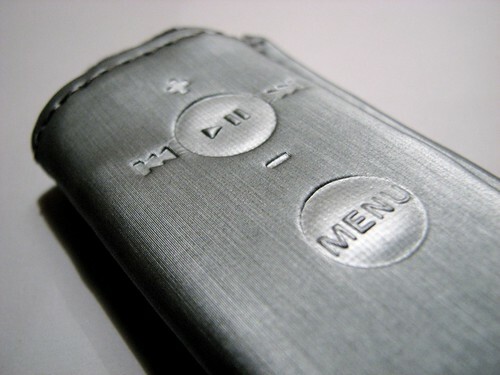 A cover for your Apple Remote decked out in the same stylish fashion with silver exterior. Whilst in the case, your remote will be covered but still remain useable with the keys embossed on the outside. Also included is the ShieldPad. This is nothing more than a micro fibre cloth, which you can use to clean your screen and is designed to cover the keyboard when not in use so that dirt is transferred from it to your screen. ShieldPad is also meant to double up as a portable mouse pad, however I fail to see how this is possible. You’re meant to fold the keyboard cover in half and use it as a base for your mouse. However in practice when I used it, the whole thing kept moving about with the mouse making it ineffective and redundant. So whilst the Moshi Codex appears to be the best product ever. I must now bring you back down to reality. 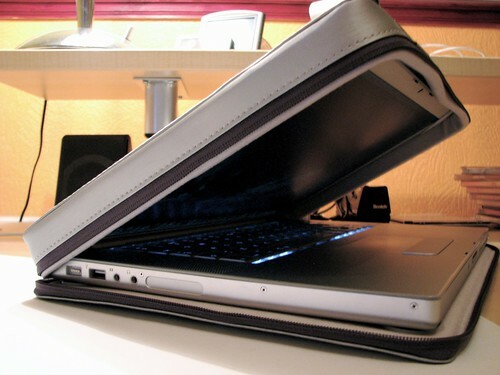 First of all, in terms of practicality, how many people actually use covers or cases for their laptops? Well just like all other covers and cases, there’s no room for your power adapter, and since nobody has invented a battery that lasts even a day, let alone a week this is still something most of us will want to carry around with us on our travels. For use around the home or just in the office, the Codex excels and will be great at protecting your notebook in style, but as soon as you step foot outside, your most likely going to want to bring your accessories with you and in the Codex, like every other similar product, there just isn’t the room for it. So think long and hard about what type of use you are looking to get out of it, because if you’re not careful you may end up carrying two bags – which I’ve seen people who use products like these do! The Apple Remote case that the Codex comes with does make it difficult to use. You can’t see the physical buttons and must rely on the embossing on the case to line up with the remote so you can actually hit the right keys. It’s a minor issue but one that I found to be slightly annoying. Whenever I get my Mac out of the case, because the screen section of the cover is overlapping the release catch, it can be troublesome to get it open. I also found that the straps which holds the screen against the case haven’t been positioned well enough because when I’ve got my MacBook Pro base lined up to the feet on the enclosure side, the straps are barely holding the screen when the display is pushed all the way back. When pushing the screen all the way back, the straps will come off leaving the cover to fall back. I can stop this from happening by pushing the Mac back in to the case, but then it no longer sits on the circular discs which keeps the Mac propped up. The solution to this problem is to simply move the straps further down so that it holds the screen in place when it’s pushed back and allows my Mac to sit on the discs. These issues aside though, I’m still very happy with the way the Moshi Codex works. So often do designer products end up being impractical or pointless, but I think this time round form and function has gelled together and work harmoniously. With great looks, a quality design that serves its purpose, the Moshi Codex should be a serious contender if you’re looking for a case for your Mac. 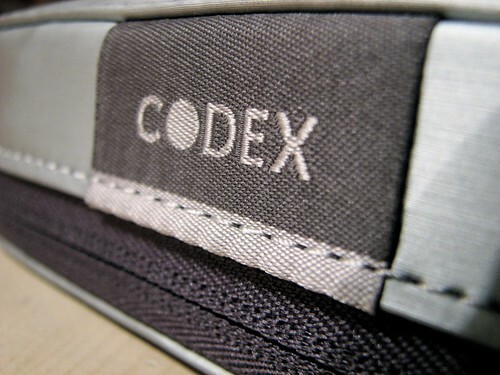 The Codex is available in silver or black for both 15 and 17-inch MacBook Pro as well as the 13-inch MacBook.